TFB President Russell Boening delivered a statement of support for the eminent domain reform bills. 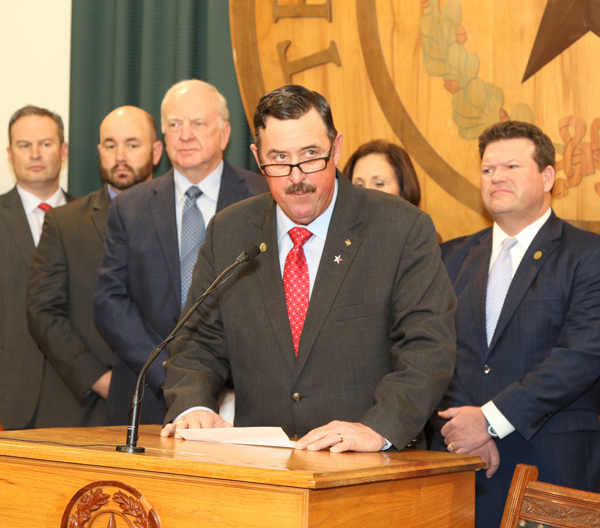 (AUSTIN, Texas)—Calling eminent domain reform “the property rights issue of our time,” Texas Farm Bureau President Russell Boening joined State Rep. DeWayne Burns (R-Cleburne) today in Austin to roll out the reform bill, HB 991. Burns is the House sponsor of eminent domain reform. Sen. Lois Kolkhorst (R-Brenham) introduced SB 421. Farmers, ranchers and rural landowners continue to complain of property takings for pipelines, utilities and other uses that do not treat property owners fairly. Complaints of “lowball” offers and land not restored in a satisfactory way are common. Often, landowners subject to takings report they are unsure of their rights. Boening is a farmer, rancher and dairy producer in Poth, Texas, near Floresville. He said the need for eminent domain for public projects and infrastructure is not in question. Fairness, he said, is the issue.